I found myself in a Catholic Church on Easter Weekend. 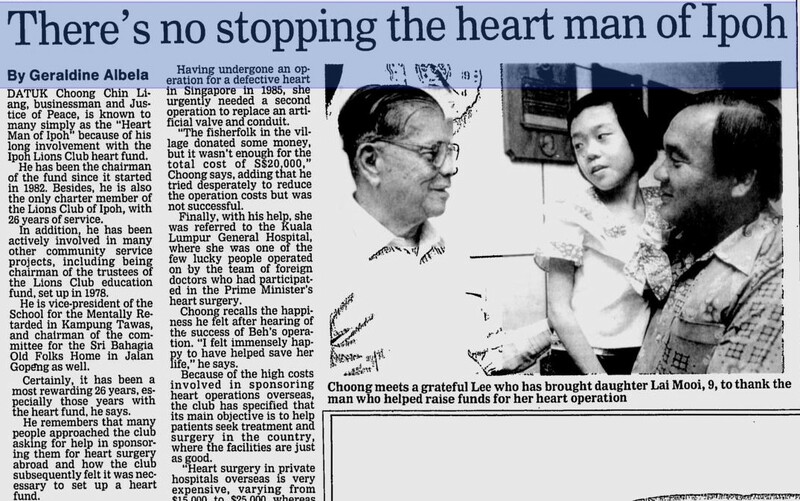 Datuk' Choong Chin Liang, DPMP,PMP,JP (1919–1998) was a Malaysian Chinese businessman, philanthropist and Justice of the Peace from Ipoh, Perak who was known to Malaysians as the "Heart Man of Ipoh" due to his philanthropy and his long involvement with the Ipoh Lions Club Heart Fund. He was known to Ipoh Residents as one of the most charitable individuals in the city and was involved in numerous non-profit organizations. Choong dedicated his wealth and industry to the many causes that he supported. Datuk Choong was the only charter member of the Lions Club of Ipoh with the most number of years of service and was also District Governor of District 308 (Malaysia,Singapore,Brunei). 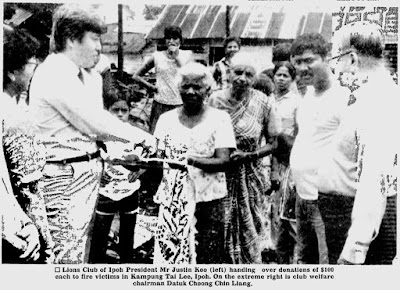 The formation of Multiple District 308 was sent by the late DG Dato' Choong Chin Liang to Lions Club International in the fiscal year of 1982/1983. Dato' Choong was married to Datin Molly Choong and had 4 children, Choong Moh Guan, Choong Moh Huat, Choong Moh Kheng, and Choong Gaik Li. Choong was also the Founder of Chye Hin Construction Company, which later renamed itself to Mudajaya Construction. Mudajaya Construction was one of the companies that now form IJM Corporation Berhad, one of the largest public listed companies on the Kuala Lumpur Stock Exchange. Mudajaya Group is itself also a noted construction company publicly listed on the KLSE. Thanks to the work of a relation Choong Swee Hock pictured on the right above, who published his family tree in a booklet given to me, I now know the relationship of everyone in the Choong family to our Chong Family. Apparently the first wife of his grandfather was the aunt of my grandmother, Cheah Suan Kee whose position in our family chart is found at http://familylane.info/history/ . The Choong family are very big today as the grandfather Choong Boon Chye had 4 wives and adopted two daughters. They have kept close together due to established family traditions to meet regularly for annual lunches and dinners instead of just on the occasion of a marriage or death of a family member only. I have offered my assistance to Swee Hock's nephew Koon Eu to create web pages as ours so that we could be linked on the web. The school holidays in Sinapore was just a week and the older boys were too busy with band practices and other extra-curricular activities so only Ern and Ray could make it to Kuantan. Ern on arrival immediately goes to find his best friend Rex in Kuantan who is over-joyed to meet his old friend again and felt comfortable to share his play pen. Soon the two boys began having fun with Rex chasing them round the block. One can't help noticing the smile in their faces as they feel and touch the sand and water in the natural beach of the East Coast compared to man-made beaches in Singapore. Ray quickly begins to build his sand castle which actually remained till the next morning. As for Dad, he and his friend took the challenge to launch the boat to the open sea but the waves of the South China Sea were just too strong and they gave up! Dad's oldest brother and wife were visiting Kuantan too and everyone enjoyed a nice sea food dinner hosted by Dad's 3rd brother seated second from the left. Over the weekend the country held its General Elections on 8th March 2008. I went to the voting center as I usually do and casted my vote with some thoughts in my heart and mind. Anyone likes to guess who I voted for? Many were concerned about the protests in the streets that have even gone to the news in CNN and Aljazeera. My first thoughts were that such protests occurring in the country is a healthy sign that democracy is alive in Malaysia and that the government needs such feedback from its people. Meanwhile I was paying attention to the news of the election process taking place in the other countries of the world such as in the USA, Pakistan, Kosovo, Korea, Russia and African nations. The democratic system seems to be the choice of today for the people to choose their governments. Most countries are gravitating towards freedom and power to the citizens to choose their governments, a strong influence from the Americans perhaps but there is always a price to pay. What I'm keenly aware is that no government is perfect and mistakes can be made by anyone so there must be a check and balance system for governments and leaders to be accountable for their decisions and actions.